This remarkable 08 Days tour of adventure in snow capped spots includes Almora Munsiyari Khaliya Betulidhar for Skiing presents by Holiday travel India. Almora is a cantonment town in the picturesque Kumaun region of Uttarakhand situated at 1651 mts above sea level. It is endowed with exceptional natural beauty and rich cultural heritage, exquisite handicrafts, delectable cuisine and exotic wildlife. On the other hand Munsyari is a fantastic skiing destination where village serves as the start for treks to Milam, Namik and Ralam glaciers. Other high altitude destinations in this region which are ideal for skiing are Khalia Top and Betulidhar. Skiing in Munsyari offers breathtaking panoramic eye shots of the snow peaks. The Himalayan settlement of Munsiyari is an un-trodden pathway is the closest; you can get to experience the Greater Himalayas. So enjoy the Skiing from this exciting Munsiyari Skiing Tour package with finest camping accommodations in Khalia Top and Betulidhar which start from Delhi. What is unique in “Munsiyari Skiing Tour package “? Munsyari is a multi-tasking spot, turned into the real vacationer destination and skiing spot. Well known for its incredible beauty and also called the travelers heaven. Munsiyari offers one of the real winter trip spots with enough spaces for skiing, with camping in outstanding views of Khalia top & Betulidhar. Khalia Top and Betulidhar perched at a height of 9000 ft, are two high altitude places that offer excellent conditions for skiing in Himalaya. They are the two high height places in Munsiyari giving the best slopes to skiing. The most salient feature of this place is absolutely gorgeous sunset and sunrise with snowy backgrounds is the uniqueness of this package with Almora’s Bright end corner sightseeing. Children below 14 years, heart patients, expecting mothers, people with serious ailments are not permitted for skiing. However Guide can permit skiing for children after personally meeting the child for certain slopes of the mountain only. To covering skiing area by locale instructors & guide. Early morning tour starts from Delhi for adventures of Skiing ahead, travel by surface to Almora reach by evening. On arrival check in at Hotel & relax, evening free for individual activities. Today After breakfast check out from the hotel and drive toward Munsiyari reach by evening. On arrival check in hotel and relax. Later we visit local seeing places includes Birthi falls, Maheshwari Kund, Darkot. In the evening may visit market of Munsiyari then back to accommodation. Lunch: May have lunch at Wayfarer restaurant (TA rating 3.5 / 5) serves Indian continental cuisines veg. & non veg. cuisine. Birthi falls is situated at a distance of 35 km. from Munsiyari falling from the height of 126m. The falls lies near Tejarm on the main Thal-Munsiyari route and can be reached via the Kalamuni Pass. It is surrounded by dense forests and the Himalayas. It is a must visit spectacular place offers an extremely refreshing experience. It makes for an ideal place to sit and enjoy tea and lunch with lush green surroundings blooming in various colors. The Maheshwari Kund is a natural lake surrounded by rhododendron shrubs and provides a beautiful view of the Panchchuli Peak. This Kund is located just a few kilometers walk from Munsiyari & is often referred to as the Mehsar Kund by the local people. It a beautiful place with a very fascinating legend attached to it once cursed by a Yakshi who use to live in a small lake there, the place faced drought for several years. A small quaint village just 6km from Munisyari is a paradise for shoppers. It offers a varied range of articles to buy, the most famous being pashmina shawls and sheep wool blankets. One can also witness the rich culture and craftsmanship of Kumaon people through its old artistic houses. Today after breakfasts we proceed for Khaliya top this is 6 km. trek. On arrival check into your pre- booked camp and relax. After lunch you are free for independent activities. In the evening enjoy recreational activities of camp like Candle light dinner & Bone fire at night. Note: Children below 14 years, heart patients, expecting mothers, people with serious ailments are not permitted for skiing. Today after breakfast ready to enjoy the most awaited activity. 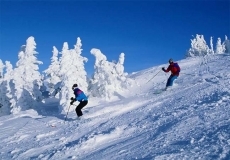 Skiing is a recreational activity of winter sport in which the participant uses to glide on snow. Enjoy the skiing at slop of Himalaya and panoramic view of Himalayan peaks of Khaliya. After enjoying 3 hours skiing adventure retune back to camp for lunch. Rest of the day free for independent activities or may take part of the camp activities. Later in the evening enjoy recreational activities of camp like Candle light dinner & Bone fire at night. Khaliya skiing trek: Khuliya Top is an easy 10.0 km trek from Munsiyari. It offers a magnificent view in summers of great Himalayan ranges. The winters offer a perfect spot for skiing with snow laden alpine slopes. The five famous peaks namely Panchachuli, Hardeol, Rajrambha, Nandakot and Nandadevi are clearly visible from here. Today after having light breakfast we proceed to another place for Skiing & camping that is famous Betulidhar. It is an only 7.0 km easy trek from Munsiyari. On arrival check into camp & relax. Take pleasure of the most popular adventure of snow that is skiing. After enjoying 3 hours skiing adventure retune back to camp for lunch. Rest of the day free for independent activities or may take part of the camp activities. Later in the evening enjoy recreational activities of camp like Candle light dinner & Bone fire at night. Betulidhar Skiing Trek: Betulidhar is located at an altitude of 2,748 meters above the ocean level covered with the crimson hues. It is covered with gardens of rhododendron. It provides amazing views of snow clad mountains all around. Betulidhar provides ideal skiing slopes during winters. The sunrises and sunsets are festivals of colors, such beautiful hues of nature are seen. Today early morning check out from the Khalia camp and start downward trek to Munsiyari. There after drive to Almora & reach by evening, on arrival check into hotel & relax. Evening will be free for individual activities or may go for visit famous sightseeing of Almora that is Bright end corner. Later back to hotel and relax. Bright End Corner: Bright End Corner is a hilltop site 2 km away from Almora that offers a magnificent view of the valleys and peaks of Kumaon Region. This site is famous for picturesque sunset and sunrise seen through the Himalayan peaks. There is a library named after Vivekananda which has numerous books on literature and teachings. You can also visit Vivekananda Memorial where Swami Vivekananda had stopped for a while on his journey to the Himalayas. Swami Vivekanand Library and Memorial is another attraction of Bright End Corner. Today after breakfast check out from hotel and proceed toward Delhi, reach by evening. On arrival transfer to Airport / Railway Station for further journey ahead. Tour End with memories. Keep medications such as inhalers, bee-sting kits, insulin and first aid box etc. Almora has a pleasant and cool climate all through the year with the annual average maximum temperature is around 23°C and average minimum temperature is about 11.5°C. Summers (April to July): are moderate with maximum temperature below 30°C and is ideal for all sightseeing visits. Monsoons (August to October): are associated with moderate rains, it makes Almora beautiful and attractive with fresh greeneries. Winters (December to February): offer chilly cool climate with temperature touching down to 4°C. December and January months are freezing. Best time to visit Almora is during March to November. March to June months are inviting for outings and sightseeing. July to November months is really beautiful with intermittent showers and those who like to be in rains are welcomed. December to February months is chilly with snow fallings and dew. It is a scenic spot dedicated to Goddess Kali, situated at a distance of 5kms from Almora. The views of the snow capped Himalayan peaks are invigorating from here. Kalimath, offers a panoramic view of the snow capped Himalayan peaks. Deer Park is situated just 3km from Almora. Deer Park comes in NTD (Narayan Tiwari Dewai). Deer park, a wildlife tourist attraction of Almora, houses a collection of some deer species, leopards and the Himalayan black bear. Deer park is a perfect place to enjoy the evening time amidst towering pine trees. Vallabh Pant Public Museum, situated near the bus stand of Almora . The museum remains closed on Mondays and other Government Holidays. It is open from 10:30 A.M. to 4:30 P.M. State museum of Almora or Govind, has a rich collection of fascinating items relating to history, archeology, development of art, culture, and the life style of this region. The state museum displays the archaeological finds from the Katyur and Chand periods and exhibits a wide collection of folk paintings. The ravishing views of the mountains covered with pine and deodar trees are enchanting from Simtola. Simtola is a popular spot for camping and picnicking and it is situated 3km from Almora. Simtola is a famous tourist spot in Almora which is ideal for picnic and camping. Tourists can enjoy the stunning views of the mountains covered with pine and deodar trees from Simotla. Situated 7km from Almora this historical important temple is an example of intricate sculpturing. It is the second most important temple to Sun God, the first one being Sun Temple of Konark in Orissa. Katarmal is more than 800years old. Gollu Temple is dedicated to Gollu Devta, an incarnation of Gaur Bhairav. Situated 8 km. from Almora the deity of this sacred temple is reputed to make every wish comes true, provided the worshipper ask for it with a clear conscience. All he asks for in propitiation is a bell, as was evident from the thousands of bells strung across the temple premises. Anyone can even seek Gollu Devta"s divine intervention by writing to him. Stacks of letter are pinned all over the temple along with bells. The stunning view of the Himalayas can also be seen from the Chitai. Shiyahi devi is the very famous trekking root and picnic spot of Almora from where tourists can see very close view of the Himalayas. The main markets or bazaar of Almora are Lala Bazaar, Malli Bazaar, Karkhana Bazaar and Thana Bazaar. You can buy local utensils, clothes, and other things of your necessity in these bazaars. Kasar Devi Temple is situated at a distance of 7km from Almora. This sacred temple is also mentioned in Skanda Purana and it is also said that Swami Vivekananda meditated here in the year 1890. An inscription found on a stone boulder, indicates that the temple was built by a king named Rudrak. The place affords enchanting view of the splendid Himalayas. Kasar Devi Temple is an ancient temple of 2nd century which was said to be built by a king named Rudrak. The enchanting view of the splendid Himalayas can be enjoyed from Kasar Devi temple. Koshi, 12 kms from Almora town, is a place of natural beauty which is known for the Govind Vallabh Pant Institute of Himalayan Environment & Research. Koshi is also a popular picnic resort with a guest house for overnight stay. Lakhudiyar is one of the most important pre-historic sites, situated at a distance of 20 km from Almora in the hills. Lakhudiyar is known for numeral caves (Lakhudiyar means one lakh caves) which have beautiful paintings of pre-historic man on their walls. The temperature touches sub zero levels during winter. Whole area will be covered with sheets of snow. Very heavy woollen clothes are a must to escape from the biting cold during winter in Munsiyari. This season is usually chosen by those tourists who wish to see snow capped Himalayan range. The maximum temperature during summer in Munsiyari is 24° Celsius. Light woollen clothes are required during summer. This is also the season when tourists can enjoy a clear view of high peaks like Nandakot, Nandaghungti, Rambha, Shiplakot and Panchachuli. Also the flora and fauna of the Himalayan forest can be enjoyed during this season. The maximum temperature that has been recorded during monsoon is 15° Celsius. There will be a drop down in temperature during monsoon. This season is often opted by nature lovers and adventurists. Rain coats are a must during a trip to Munsiyari during monsoon. Travelling and sightseeing during monsoon can get difficult due to heavy rain falls and landslides. The best time to visit Munsiyari is March to June and mid-September to October. Tourists interested in sightseeing and trekking visits Munsiyari during this time. A prominent peak which is visible from all the main points of Pithoragarh district, Panchachuli peak looks majestic from Munsiyari. The beauty of the five peaks lying in the Johar Valley is so captivating; it adds charm to this already delightful place. Kalamuni Top is located at a distance of 15 km from Munsiyari on the way from Birthi, at a height of 9,500 ft on the main route to Munsiyari from the Birthi Falls. There is an old Kali temple at this hilltop from where the Panchchuli mountain range can be seen. The place is famous for its Kali Temple dedicated to Naga God. The fantastic view of Panchachuli peak from there flanked by the sprawling pine forest is a place must visit. Thamari Kund is a natural lake and is surrounded by paper trees. This enrapturing natural lake perfect for relaxing is bounded by nature’s beauty in abundance. The lake is known for a significant population of musk deer which come here for drinking water. From Alpine trees to paper trees, this place also houses many Musk Deer and enriched in variety of flora. Khuliya Top is an easy 10km trek from Munsiyari. It offers a magnificent view in summers of great Himalayan ranges. The five famous peaks namely Panchachuli, Hardeol, Rajrambha, Nandakot and Nandadevi are clearly visible from here and this makes it an amazing experience for even a first time trekker. With trekking in summers, the winters offer a perfect spot for skiing with snow laden alpine slopes. A 3km trekking from Munsiyari will take you to one of the ancient and oldest temples established in earlier days. Nanda Devi temple, a pure epitome of creativity and architecture, it is regularly visited by the devotees in large number. The Ralam Glacier lies on the Kumaon Hills, 2,290 m above sea level. The glacier can be reached from Bageshwar and Pithoragarh by trekking. The best time to visit this place extends from April to June and September to November. The Milam Glacier The glacier lies to the south of the Himalayas in the Kumaon region and is around 16 km long. It originates from the slope of Kohli and Trishul peaks. The Milam River originates here and finally merges with the Pindari River. The Namik Glacier is known for various sulphur springs and waterfalls lies in the Kumaon Himalayas in the Nachani Village. The Ram Ganga River originates here. Munsiyari is a small village which do not offers many eating outlets or restaurants. The small dhabas in the village mostly serve delicious Indian and Kumauni cuisines. Kulka is a very delicious local delicacy comprising of flour and potatoes fried in Dhungar is a local herb. The best option is the in-house restaurant at hotel. These restaurants offer Indian, Chinese, continental and Kumauni cuisine. Munsiyari is a popular trekking destination, and serves as a base to various popular trails. Some of the popular treks in the area include the Khalia top trek, which is a 2-hour trek which rewards one with lush green meadows and traces of snow, and the Thamri Kund trek, which is a much more modest and easier trek. Nanda Devi Trek which embarks from Munsiyari, perched at an altitude of 2290 m. The trek is quite amusing that leads to the higher Himalayan region adorned with mysterious natures beauty. A number of hotels arrange for these treks and other adventure activities. The river is a popular spot for white water rafting & a number of hotels and setups in the area provide facilities for camping and bonfire. Marked on a popular trekking trail, and known for beautiful views of the Panchuli peaks, Khaliya is also a popular site for skiing in winters. Munsiyari is also a favorite for bird watchers, given the huge variety of species that can be spotted here. Little pied flycatcher, Black Redstart, Streaked Laughing Thrush, Himalayan Woodpecker, Verditer flycatcher, Grey winged black bird, Scaly Billed Woodpecker, Black-lured Titer are some of the countless birds that can be seen in and around this area. Munsiyari offers some of the best pashmina shawls and sheep wool carpets. Organic potatoes are grown here and quite famous. However, the shopping can be done only at Main Market.